A funky, versatile and functional collection of lounge soft seating that is adaptable to multiple environments and spatial needs. Available in choice of fabric finishes and frame styles. 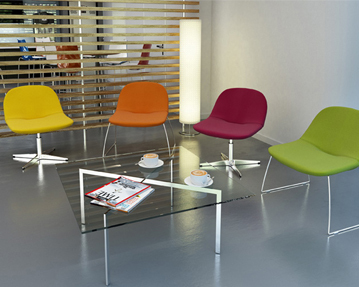 Basics designs ideal for adding a touch of colour to any office space and looking contemporary, vibrant and chic. Lounge seating is designed with comfort, functionality and durability in mind, making it the professional choice for the office, breakout area or meeting room. Upholstered in leather or fabric to your selection on a chrome finish swivel base with optional head rest and arms, will add a touch of sleek, modern style to any office space.